Americans are divided over whether to build the Keystone XL and Dakota Access pipelines – issues that returned to the forefront after President Donald Trump signed executive orders to move forward on their construction. The Keystone XL and Dakota Access pipelines have become touchstones in the debate over energy and the environment. While parts of the larger Keystone pipeline have already been completed, the Dakota Access pipeline is in earlier stages of development. About four-in-ten (42%) favor building the Keystone XL pipeline, while 48% are opposed, according to a national Pew Research Center survey conducted Feb. 7-12, 2017, among 1,503 U.S. adults. The pipeline, which would carry oil from Canada’s oil sands region through the Midwest to refineries on the Gulf Coast, had been blocked by the Obama administration over environmental concerns. 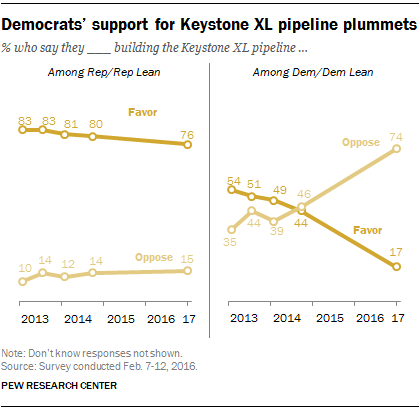 Support for Keystone XL has fallen since 2014, largely because of a sharp decline among Democrats and Democratic-leaning independents. The share of the overall public favoring the pipeline has fallen 17 percentage points since 2014 (from 59% to 42%). Just 17% of Democrats favor building the pipeline, less than half the share that did so three years ago (44%). Views of the Dakota Access pipeline, which would carry oil thorough North and South Dakota, are similar to opinions about Keystone XL: 43% favor building the Dakota Access pipeline, while 48% are opposed. The partisan gap over Keystone XL is stark. About three-quarters (76%) of Republicans and Republican-leaning independents favor building the Keystone XL pipeline; about as many Democrats (74%) are opposed. Republicans’ views of the pipeline have changed little in recent years, but in November 2014 Democrats were divided (44% favored, 46% opposed). In March 2013, Democrats, by a 54% to 35% margin, favored building the Keystone XL pipeline. Democrats continue to be ideologically divided over building the pipeline, but since 2014 support for the pipeline has fallen among the party’s liberals (from 33% then to just 9% now) and conservatives and moderates (51% then, 26% today). Support for the Keystone XL pipeline has declined among nearly all demographic groups since 2014. As was the case then, there are gender, age and educational differences in attitudes about the project. Most men favor building the Keystone pipeline, while most women are opposed. And while a majority of those 65 and older favor its construction, those younger than 30 oppose it by about two-to-one (59% to 29%). Adults who have not completed college also are more likely to favor Keystone than are those with at least a four-year degree. Earlier this month, the Trump administration gave final approval to the Dakota Access pipeline, which would transport oil through the Dakota states. Construction of the Dakota Access pipeline has faced opposition from Native American groups and environmental activists. As with Keystone XL, views among the public overall are mixed over building a Dakota Access pipeline: 48% say they oppose it, while 43% favor the project. And again with the Dakota pipeline, there are sharp partisan divisions. About three-quarters of Republicans favor the project while 69% of Democrats say they oppose it. Opinions among demographic subgroups mirror those of the Keystone XL pipeline, where support is stronger among men than women (50% vs 35%), and among older Americans more than younger one (59% of those 65 and older vs. 26% of those younger than 30). As we found last month in our annual policy priorities release, views on prioritizing climate change and protecting the environment are about as politically divided as ever. A solid majority (62%) of Democrats now say that climate change should be a top priority, while only 15% of Republicans share this view. A decade ago this partisan divide was much smaller. In 2007, about half (47%) of Democrats prioritized dealing with global warming, compared with 26% of Republicans. Note: Survey topline can be found here and methodology can be found here.